These are great little starter course meals. I love mushrooms and baking them brings out the flavour beautifully. They’re really easy to make too, which means much praise, minimum effort. Cheers. Wipe any dirt from the mushrooms with paper towels or a mushroom brush if you have too much time on your hands and actually have one. Remove the stems, and chop them finely. Oil a large baking sheet, large enough to fit all the mushrooms in one layer. In a mixing bowl, combine the chopped mushroom stems, breadcrumbs, parsley, garlic, sage, salt, pepper and 1 tablespoon of olive oil. 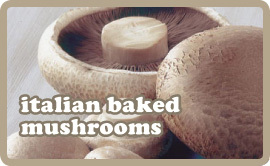 Sprinkle the mixture over the mushrooms and bake in the oven for 20 – 25 minutes. Serve them hot with more pepper and maybe a little parmesan and a drizzling of extra virgin olive oil.